Rosaline Fern (Rakes) Hemmer was born to Joy and Cassel (Rawlings) Rakes on April 10, 1929 in Nebraska City, Nebraska. She grew up in Nebraska City and graduated from Nebraska City High School. She was united in marriage to Jay Hemmer on March 29, 1947 at the Baptist Church in Nebraska City, Nebraska. They were married for 62 years. Jay passed away June 28, 2009. Rosaline worked for the Campbell’s Soup Company for 25 years, where she retired. In their spare time, Jay and Rosaline sold rugs that she wove on a loom. Jay cut strips of cloth and tied knots on over 2000 rugs that they sold at the Farmer’s Market in Lincoln for over 10 years. Rosaline sewed shorts, shirts, leggings and blankets for the Lincoln City Mission and her eight grandchildren. She loved sewing, doing stained glass, gardening and her and Jay loved traveling and were “Snow Birds” for over 25 years going to Gulf Port, MS and Gulf Shores, AL. Rosaline passed away on February 6, 2019 at the age of 89 years. 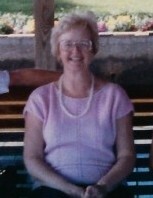 She is survived by her son Chuck Hemmer of Lincoln, daughters, Susan Kerner and husband Alan of Tecumseh and Peggy Bohling of Lincoln, eight grandchildren, 19 great-grandchildren, brother, Merle Rakes and wife Muriel of Nebraska City, sister, Linda Wademan and husband Fred of Nebraska City and numerous nieces and nephews. Rosaline was preceded in death by her parents, husband, Jay, sons, Ron and Dan Hemmer, brother, Dale Rakes and wife Lou and sister Dorothy Gess and husband Ellsworth. Memorial services will be held at 11:00 Monday, February 11, 2019 at the First Baptist Church in Tecumseh, Nebraska with Rev. Hugh Giesbrecht officiating. Visitation will be held from 1:00 p.m. to 5:00 p.m., with family greeting friends from 2-4 p.m. Sunday, February 10, 2019 at the Wherry Mortuary in Tecumseh, Nebraska. Memorials in lieu of flowers may go to the Lincoln's City Mission for children's clothing. Private family inurnment will be in the Grandview Cemetery, rural Sidney, IA, at a later date.